Macro photographs are often spoilt because of the background. 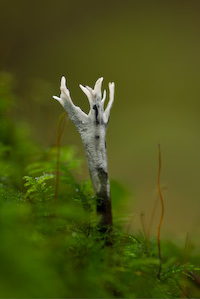 In this example of Xylaria hypoxylon, more commonly Candle Snuff fungus, you can see that the background and, to some extent, other foreground areas are distracting. 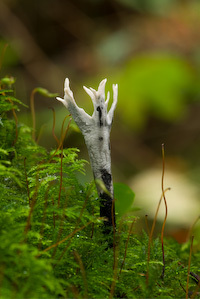 You can clearly see that there is a leaf behind the tips of the fungus, and also another lighter one that is really distracting. This is because a small aperture of f/22 has been selected. This ensures that the whole of the fungus is sharp, but at a cost! A better option is to use an aperture of f/4 or greater. This results in shallow depth-of-field and a clean distraction-free background. With this technique you ensure faster shutter speeds - in the example (right) 1/4sec rather than 10 seconds (above). But, more importantly, there's no background clutter. You have to be more critical when focusing as a slight discrepancy could render the shot out of focus. Also when the subject has any depth you have to focus at the precise point to ensure it's all sharp.